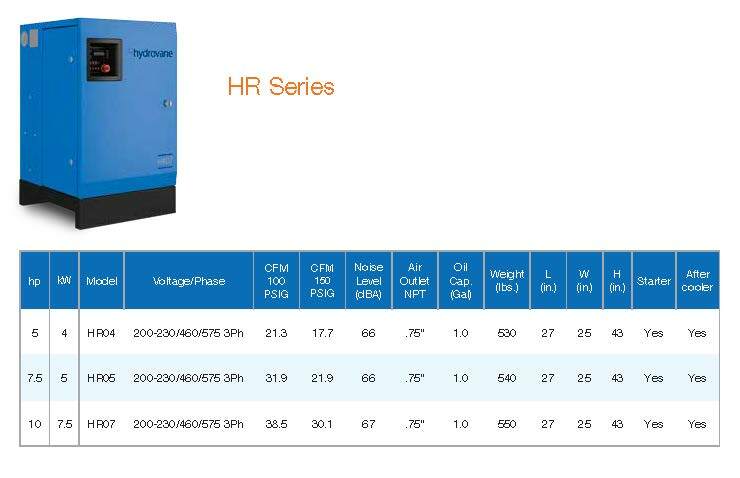 The hydrovane HR Series enclosed fixed speed rotary vane compressor line offers world class flexibility and reliability, and the smallest footprint of any rotary compressor in the industry. Slow speed direct drive operation, coupled with few moving parts means less components to fail and no power loss through belts or gears. Maintenance costs are reduced by the simple construction and grouped service components. The 5-10HP HR Series hydrovane compressors are an extension, at low HP, of the well-established, robust HR Series hydrovane compressors. These rotary sliding vane compressors are reliable, versatile and cost effective.